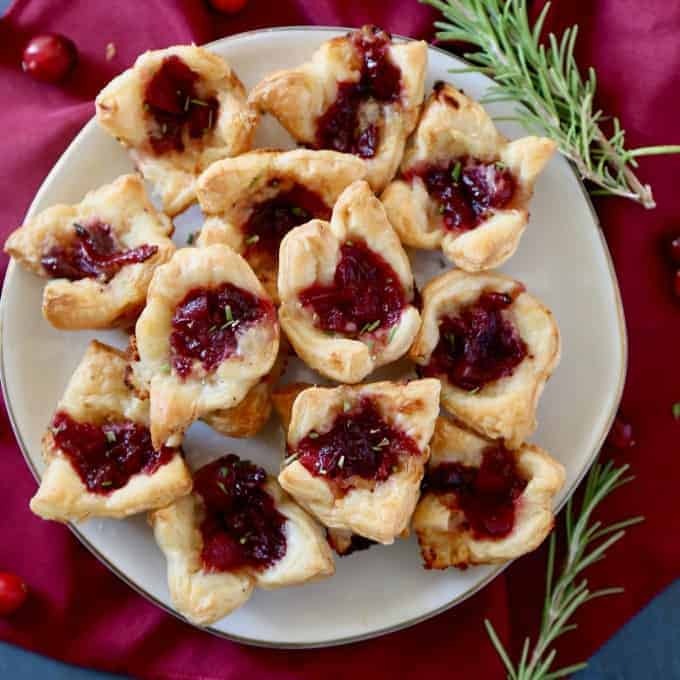 These Cranberry Brie Bites are an easy appetizer to make, festive, and perfect for your holiday party. With only three ingredients keep the focus more on friends and family instead of the food! 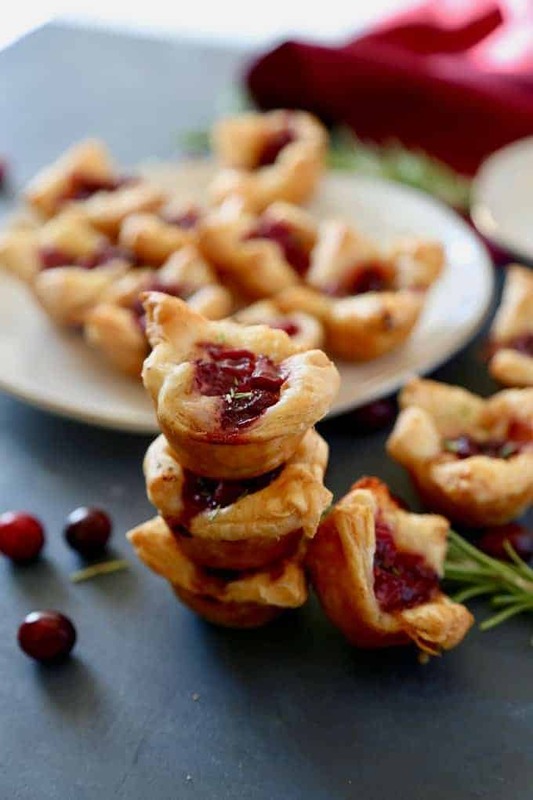 All you need is a store bought pastry, brie and cranberry sauce (add in some rosemary for garnish) and your guests will be popping these delightful bites of deliciousness into their mouths and begging you for the recipe! Hello Friends, it’s Jackie from TheSeasideBaker and I’m back with another delicious recipe! I love to cook (obviously) but during the holidays it’s another story. With the holiday meal prep and edible gift assembly line, the last thing I want to do is slave over an intricate appetizer recipe. That doesn’t mean however, that I don’t want it to taste like an intricate gourmet appetizer! Do you love bite sized recipes? Check out this yummy holiday dessert, Peppermint Wonton Kisses or another easy appetizer, our Beef Taco Ring! Both are great for holiday parties and perfect for a crowd! That’s where these Cranberry Brie Bites come into perfect play. This puff pastry appetizer is soon to become a favorite! 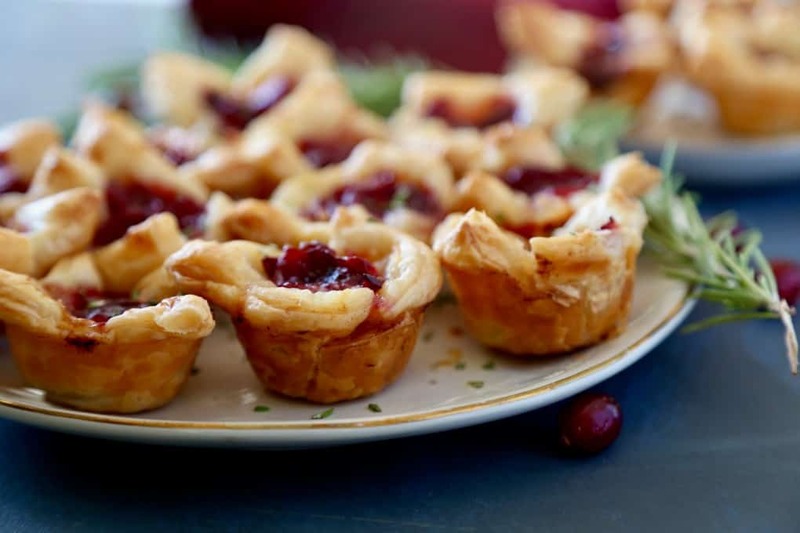 Using buttery store-bough puff pastry, some brie, and some leftover cranberry sauce, you will have a delicious appetizer ready in less than 15 minutes. What I love most about this recipe is that it is easy to prep and take. Simply ask the hostess for 15 minutes of oven time and you can have a gooey warm crunchy Cranberry Brie Bite to serve to all the guests and have them swoon. However, let’s face it, the last thing we want to ask the hostess at a big family holiday meal is some of their precious oven time. If that’s the case, don’t worry. These also taste wonderful at room temperature. In fact, after photographing them, my husband and I munched on them all afternoon. Note to self- these are better served to a crowed, because that rich appetizer will definitely haunt you the next morning on the scale. Oh well, I’ll add diet to my multiple New Year’s resolution lists. Love this Hot Chocolate Cookie Cups recipe? Anyway, I hope you all have a wonderful holiday season and make many memories with your friends and family. 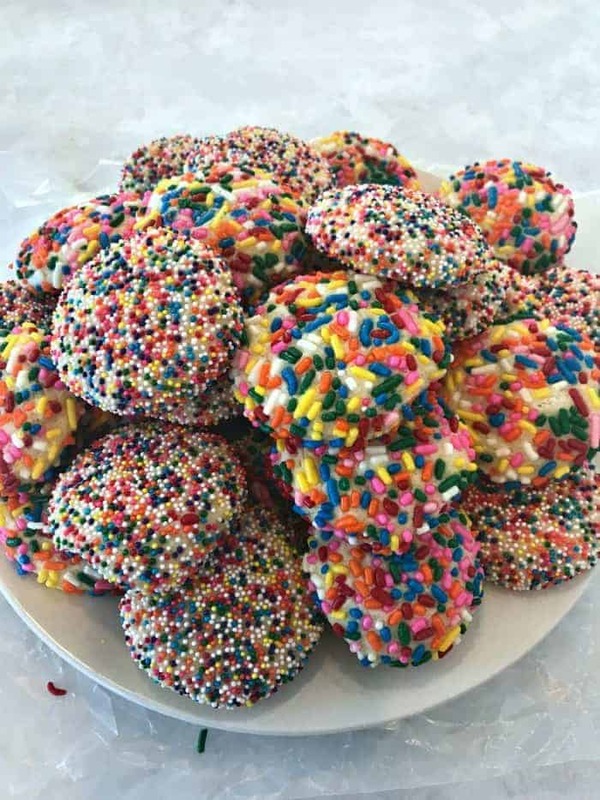 Head over to my blog, The Seaside Baker for some delicious Christmas and New Year’s Eve themed desserts perfect for celebrating! Enjoy! 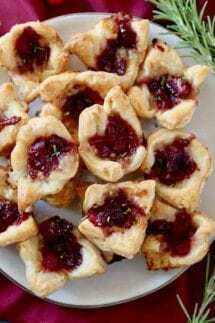 A quick and easy appetizer that everyone will love!These Cranberry Brie Bites are an easy appetizer to make, festive, and perfect for your holiday party. With only three ingredients keep the focus more on friends and family instead of the food! Generously spray 24-cup mini muffin tin with nonstick cooking spray. Slice each puff pastry sheets into 16 squares. Place each square into mini muffin tin with sides overlapping. Place a small slice of brie into the puff pastry and top with a teaspoon of cranberry sauce. Bake muffin tin for 15 minutes or until puff pastry turns golden and cheese is bubbly. Remove from oven and cool for 5 minutes before removing. Place on serving tray and garnish with finely chopped rosemary. 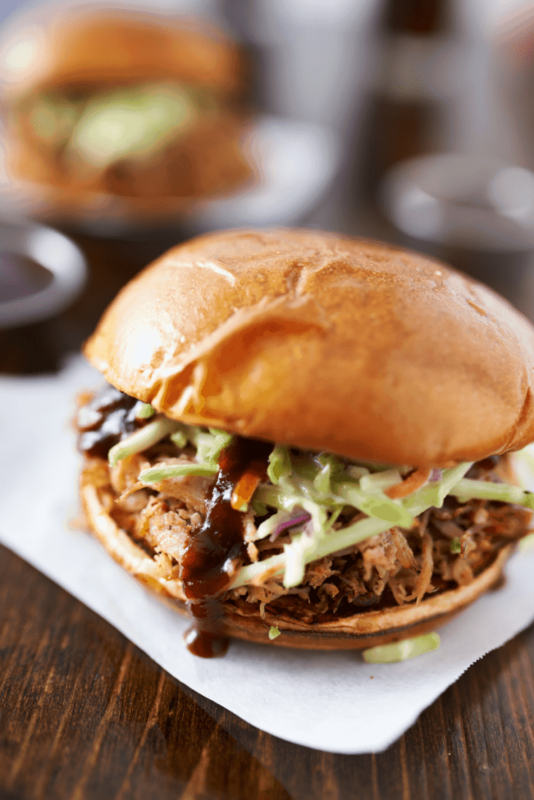 We plan to add these to our menu for this Thanksgiving. Thanks for sharing it!